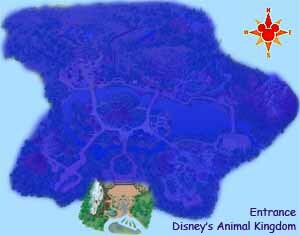 Animal Kingdom (a.k.a. AK -- how's that for acronyms) opened its gates on April 22, 1998, making it the fourth and newest theme park at Disney World. It's like no other park Disney has, due to its namesake ingredient, Animals. And I don't mean the guests, either. 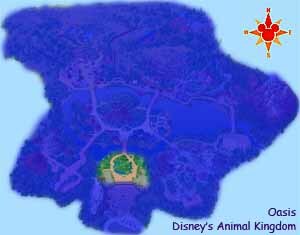 It's also Disney's largest park, some 500 acres, five times the size of Magic Kingdom, and almost twice the size of Epcot. Most of this was due to one of the premier attraction in AK, Kilimanjaro Safari. I think the most amazing part of the park, isn't the giant mountain that holds a roller coaster (or any of the attractions for that matter,) but the detail that went into the park. If you just slow down and look around, the themeing of this park is incredible, right down to the lamp posts and benches. There is an artistry here that none of the other parks have. The entrance to the park has all your normal fixtures, ticket booths, a guest services office (on both sides of the gate), lockers, stroller/wheelchair rental, guide maps, and places to buy things. What's different about this park, is a non-Disney restaurant right outside of the park, a Rainforest Cafe. 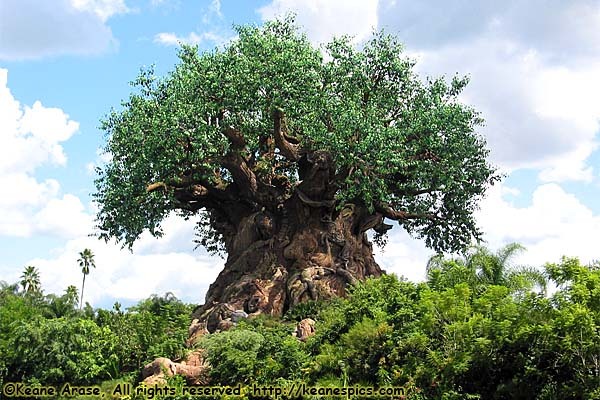 Discovery Island (below) holds the icon of Animal Kingdom, the Tree of Life. This 145 foot tall icon is visible almost anywhere in the park, and has 325 animal carvings on its bark and root system. Within the base of the tree is the Tree Of Life Repertory Theater, which shows a dedicated 3-D movie, It's Tough to be a Bug!, based on Pixar's A Bug's Life. No, it's not real, or even real wood. It's pretty much built on the same technology as the Disney mountains, but with 100,000 leaves on top. The Tree of Life itself is 50' in diameter, built around an oil rig. It looks remarkably real, and has quite a bit of detail on every side. 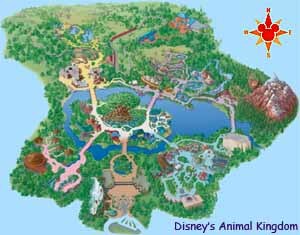 Originally opened as Safari Village, the central hub of Animal Kingdom was renamed in the early 2000's as part of a Disney makeover to convince guests that AK is not a zoo. (Nhatazu... Get it?) Safari Village was renamed "Discovery Island", originally an island on Bay Lake near the Contemporary Hotel. The island on Bay Lake was closed, and most of the animal exhibits there were moved here to Animal Kingdom. 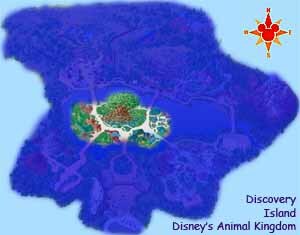 After travelling through the animal exhibits of the Oasis, you are emptied out into the main marketing area of the park, Discovery Island. You'll find the single attraction of It's Tough to be a Bug, but otherwise, this area is chocked full of gift shops, counter and quick service food, animal exhibits, and some pretty interesting themeing if you look around. End Disney's Hollywood Studios - Part 1 of 7.